The Fourth of July is right around the corner and everything red, white, and blue is starting to make an appearance! Independence day is my second favorite holiday after Christmas and as a military family, it means a lot to us to celebrate our freedoms and remember the price that was paid. Many people decorate with flags for the fourth of July, others like to go all out decorating everything in sight with red, white, and blue. The best part are the numerous foods you can make for your barbecues and Fourth of July parties. There’s so much creativity found on Pinterest, which inspired me a few years ago to come up with my own easy red, white, and blue recipe! 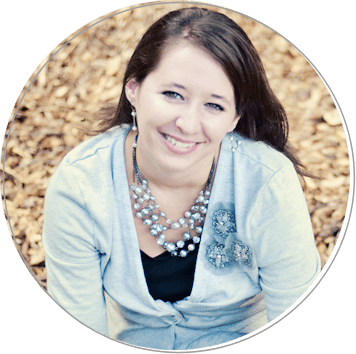 About five years ago, my husband was deployed and I was staying with my in-laws. It was the night before the Fourth of July, and I was browsing through Pinterest trying to find something creative and fun that I could make. There were plenty of ideas, but I wanted to do something unique. Love deviled eggs? 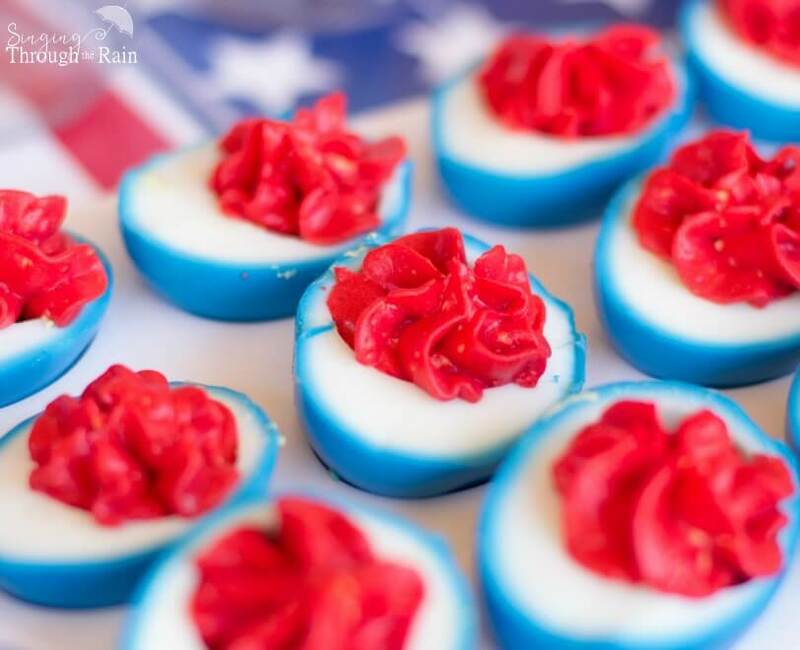 Check out these red, white, and blue deviled eggs for the 4th of July! The next morning I was talking to my mother-in-law and we started talking about making deviled eggs for her church’s Fourth of July picnic. I absolutely love deviled eggs and right then and there all kinds of ideas started to form. 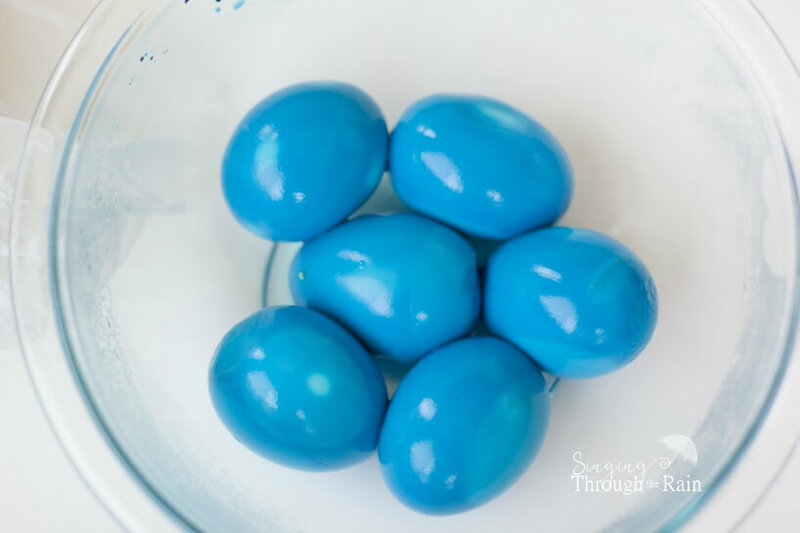 I wasn’t sure if I could dye eggs without the shells on, so I googled a bit and found a website to use as my guide. Pick out how many eggs you will need and boil them in salted water for about 20-30 minutes. When finished, drain the water and gently place the eggs in a bowl of ice water to soak until cooled off. Peel the shells of the eggs off while running them under cold water – this will help the shells come off easily. Then set eggs aside. 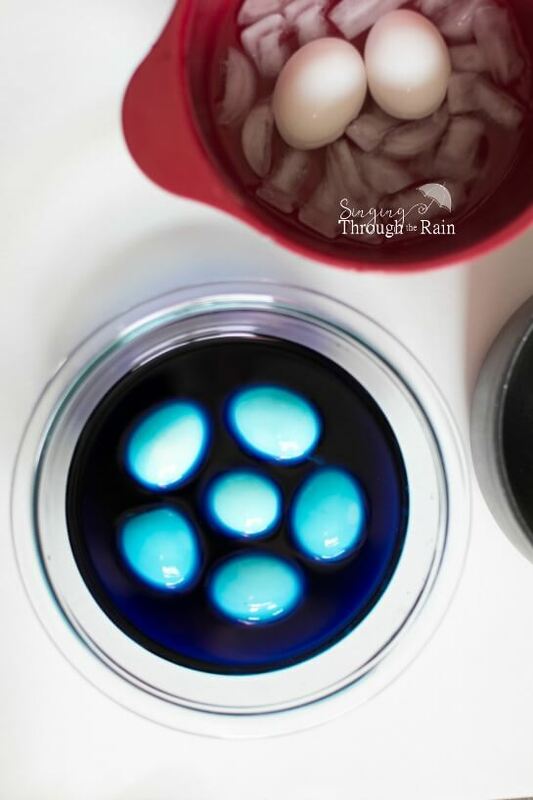 Fill a large bowl with water and a few drops of blue food coloring. Start off with just a few drops of the food coloring and add more until you get the color you desire. Remember: the darker your color is, the faster your eggs will color. Make sure your eggs are covered by the water for an even dye and soak for 20-30 minutes. Don’t take them out too early otherwise the color won’t stick. You can use a plastic spoon to gently lift them out of the water and check for the color you want them to be. Be careful not to scratch them! When they are done soaking, lay the eggs on some cardboard or a large plate covered with paper towels to soak up the moisture. Be careful when handling the eggs and watch the dye as it can get messy! Once dry, cut each egg in half lengthwise (you can use a serrated knife to make them look pretty) and put the yolks in a separate bowl. Make sure you have your serving dish nearby to place eggs in as they will be very slippery. Next, take the egg yolks and chop them up really small. You can use a mixer, blender, or even a food chopper to get those bigger chunks. Little by little, add Hellmann’s Real Mayonnaise to the blended egg yolks. The amount you will use will depend on the amount of deviled eggs you are making, so just mix and taste it until you get creamy perfection! Add the Hellmann’s Dijonnaise or Mustard next – usually about a teaspoon or two and then add a bit of dill pickle juice for a tangy flavor. Add some salt and pepper to taste and mix well. 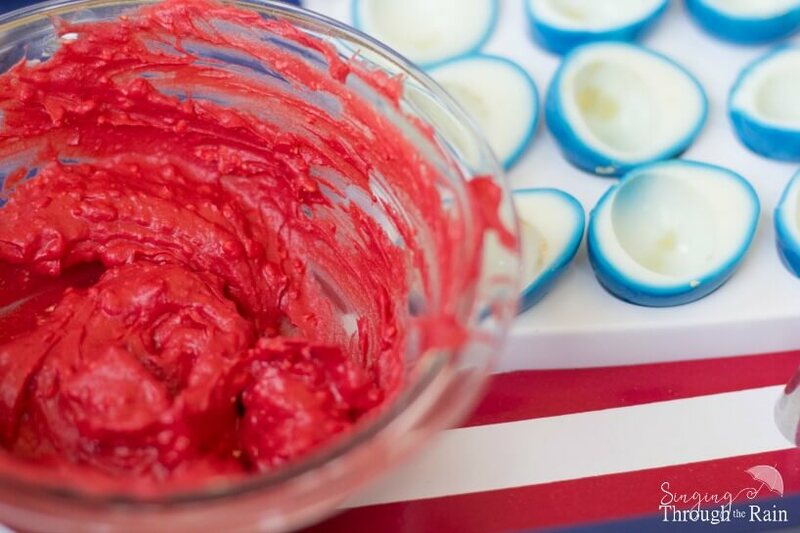 Once your egg yolks are nice and creamy, add in the red food coloring. Again, start off with just a few drops and add more until you get the color you desire. Get a spoon and scoop your red yolk mixture into a star tip cake decorator (usually used for frosting). If you don’t have a cake decorator, put the mixture into a Ziplock bag. Cut a very small piece off of one of the corners and squeeze all of the mixture into that one corner. It will work just like a cake decorator. Serve the deviled eggs right away or place in the refrigerator until ready to serve. Enjoy! So cool will going to try it son.thanks!